print calendar for your license card. Use the temporary User ID and Password provided to create an account. Create customized Day Finders, holidays lists and working day-counts ideally suited to your personal business needs. Includes the latest, market-standard, holiday data from Copp Clark for all currencies and financial centers. Our industry-standard trading application is better than ever and is now available online! Specifically designed for traders and their support staff, Trader's Day Finder® allows users to create custom day finders, specifically suited to their personal needs, using the latest holiday information. 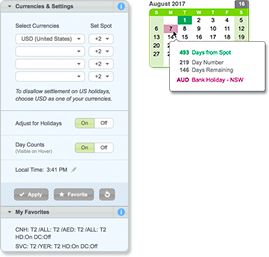 Traders Day Finder® can be adjusted for non-standard weekends and T+ protocols. Select different views for alternative ways to view generated data. Detailed day-by-day lists with forward value dates, day-counts and holidays. 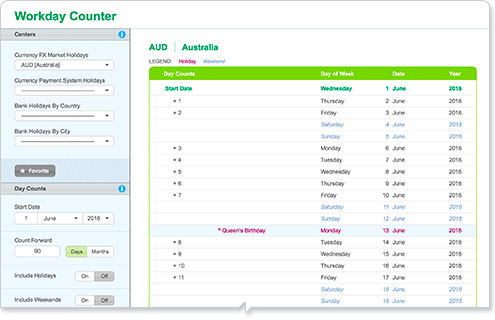 Concise monthly lists include forward value dates, day-counts and holidays only. 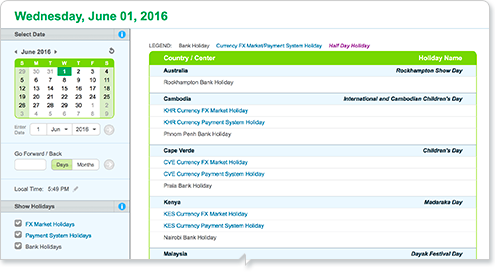 Generate detailed lists of holidays affecting financial centers for any date. Select any day up to 3 years forward and 1 year back. 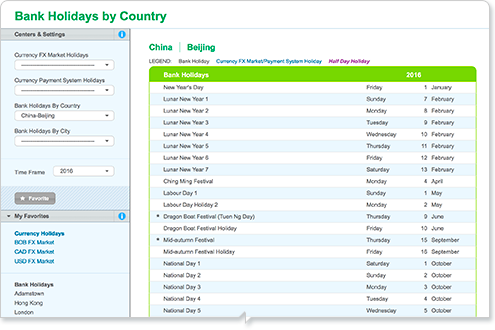 Data is sorted by country and includes information on holiday events and ‘half-day holidays’. Results can be filtered by category. Generate detailed lists of ALL holidays affecting ANY individual center. Includes data for 3 years forward and 1 year back. Add preferred centers to ‘My Favorites’ for quick reference. Choose any center related to the active selection under ‘Related Centers’. ‘half-day holidays’. Results can be filtered by year. Generate a detailed list of working day-counts for any center. Select your start date and the number of days or months forward that you would like to include in your workday count. Add or exclude holidays or weekends in the working day count. Save preferred settings to "My Favorites" for quick selections. Instant access to "Related Centers". 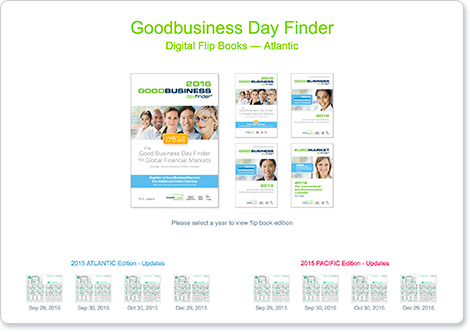 Goodbusiness Day Finder® is also available in a digital format for use with your PC, laptop or tablet. Access any previous edition registered to your account. You must have an active account and be signed in to access the Flip Book editions.